World's largest painting by a lone artist was made by a Swedish artist David Aberg. It covers above 8,000 square meters and can be easily seen in Google Earth from an height of about 1.5 Kms. Entitled 'Mother Earth' it shows a woman holding peace sign. "The idea was to do something for peace," Aberg said. "This is a peace painting that symbolizes the world with the woman as its symbol." The artist spent 2 1/2 years and 100 tons of paint to complete the painting which was made inside an aircraft hangar in Valhalla Park, Angelholm, Sweden and was later displayed in open air. The painting was completed in June 2006 and was recognised by Guinness World Records. 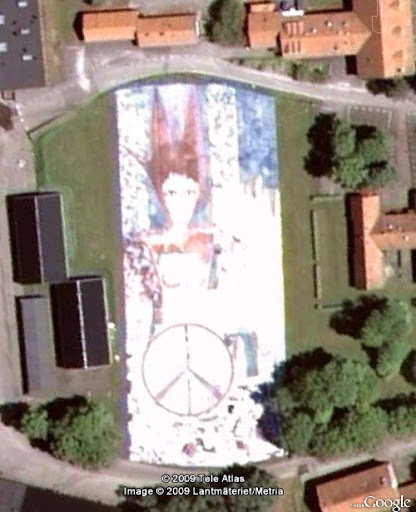 Credits: kamikazekalle, member Google Earth Community for placemarking it in Google Earth.